All families at times face struggles and difficulties, but for families who adopt or foster children who have come from the "hard places", those struggles and difficulties are often greatly increased in intensity and complexity. This study is designed to help you change the way you relate to your child and bring healing to his or her heart. 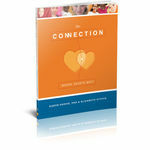 Read a sample chapter of the study guide or watch Dr. Karyn Purvis share about The Connection.